Just Another Day...: Sew Exciting! I got a wild hair the other day. It was so unlike me, but I decided to break out the sewing machine. It's actually my mom's sewing machine that she lent to me several months ago so she could teach me how to sew. Unfortunately we never were able to find the time to work together on a few sewing lessons, so the machine had been collecting dust in our spare bedroom. 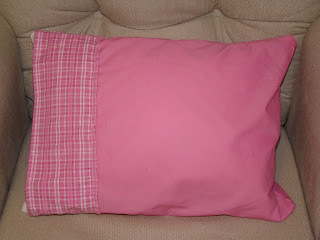 So the other day I get the wild hair to--get this--sew a pillowcase for LO! I purchased a cute little pillow for her about a month ago but of course I wasn't able to find a pillowcase to fit it! 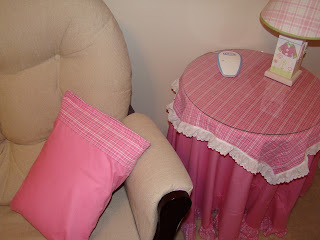 So, we just so happened to have some extra fabric laying around from a previous project my wonderful mom completed for LO's bedroom. 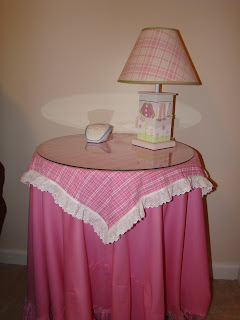 She had made a cute little tablecloth for her room that matched the theme I had selected. So I figured I could use the scraps from that project to create the new pillowcase. It was the craziest thing! Have you ever threaded a sewing machine? Do you know what a bobbin is? If not, you would've been in the same boat as me! I've never done much more than look at a sewing machine! So I turned to our trusty friend--the Internet--and found the Singer website with a ton of resources on how to do all kinds of basic things with sewing machines. About two hours later? Voila! A perfect little pillowcase for my perfect little one's room! It came out waaaaaay cute and I was impressed that I did all this with no pattern and no instructions beyond what I found online. Fun! Now I'm thinking I might attempt to try to make a new diaper bag/purse. Although I purchased an actual pattern for that one, so we'll see how that goes! I am crazy impressed! Sewing is something I have never been able to do.